This series represents what television does best. It opens a window into real lives, exploring ways to improve our social relationships, cope with emotional issues, and become more positive, resilient individuals. Hosted by Daniel Gilbert, Harvard psychologist and best-selling author of Stumbling on Happiness. 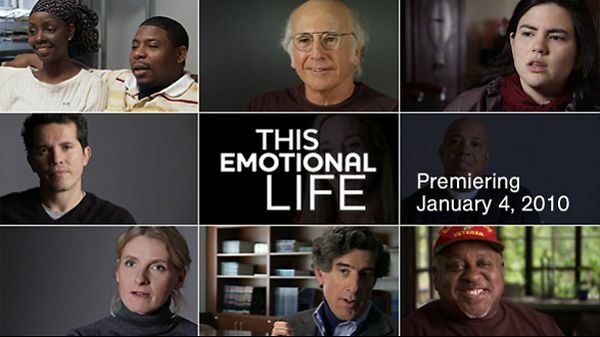 They have a wide variety of regular folks and celebrities (Katie Couric, Chevy Chase, John Leguizamo, Larry David, Alanis Morissette, America Ferrera, Richard Gere) participating in the program who reveal some very personal stories about challenges in their own lives and what they've done to get through them. I can't recommend this show enough. You can never learn too much about people and what we each experience and do to get through this life. The first episode aired last night and, if you missed it, can be viewed on their official site here.